It has taken me an entire year to get back on the blog horse. Perhaps life, work, and the current political climate got in the way, however, if my my recent experience at Major Food Group's The Grill isn't worth a post, I don't know what is. Walking into the Seagram Building is like stepping back into Mid Century New York. You feel super fancy--very Mad Men, meets Breakfast at Tiffany's, meets Working Girl. It was hump day Wednesday and I was ready for a long, delicious, power lunch. 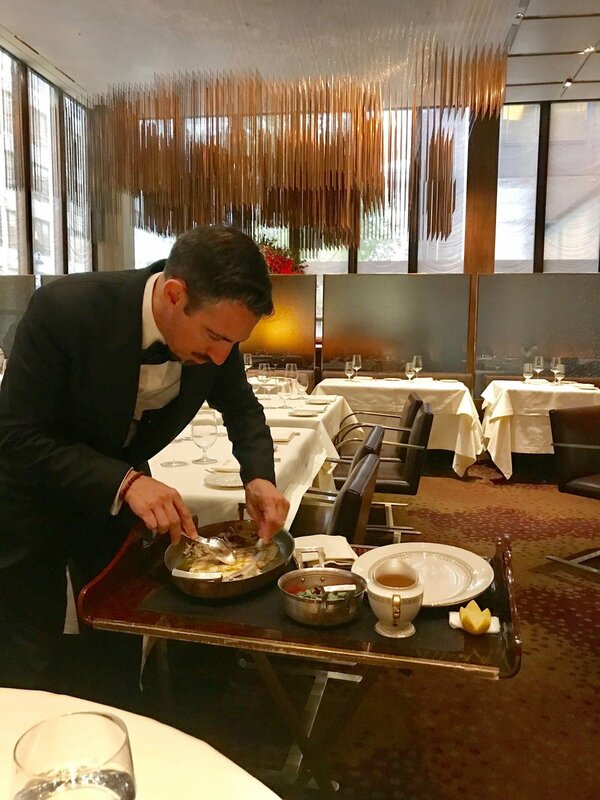 In true Major Food Group form the staff was decked out in Tom Ford suits and tuxedos and the menus are that of classic New York steakhouse. We had the Seagram Crab Cake, Avocado Crab Louis Salad, Beef Tartare and a Club Sandwich--the sleeper hit on the table. Our entrees we just as stunning as the starters, and when in Rome--you get the Dover Sole. This is presented and filleted table side. Other stunners on the table were the filet mignon and duck breast. Lemon Chiffon Cake and Chocolate Mousse for dessert! It was the perfect New York Experience. P.S. We were sat next to none other than THE BOSS himself...Bruce Springsteen. As someone who doesn't get star struck often, I couldn't help but to geek out a little bit ver what a truly small world and city we live in.